Normally we do not fry anything. However, we found that these scallops which ended up being too watery to sear properly can be cooked to delicious perfection by frying them. If the only thing you ever eat fried are scallops very occasionally, I say go for it. The scallops were breaded with panko breadcrumbs and fried for three to four minutes or until they were golden brown and delicious. Make sure to get as much liquid out of the scallops as possible by pressing them with paper towels several times. Be sure to season all the components of your dredging station. So while John cooked the scallops I made steamed new potatoes which I tossed in a little olive oil, onions, and spices. I also steamed the green beans and served them with a mustard vinaigrette. The tartar sauce is a light mayo/mustard combination with a bit of relish, lemon juice, and grated onion. Our daughter who rarely eats with us because our food is boring, said the scallops were so unbelievably delicious. Now I think we need to be treated to one of her meals that she cooks! 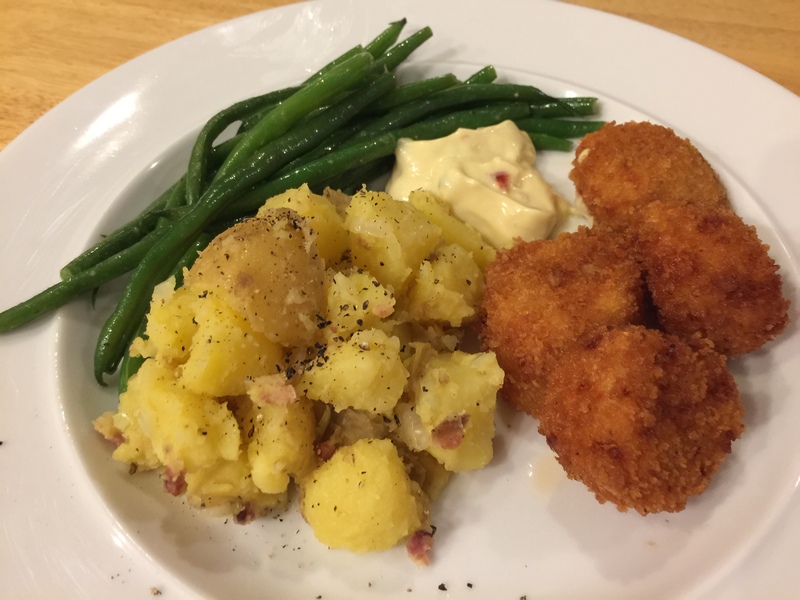 This entry was posted in pescatarian, Shellfish, Vegetables and tagged green beans, new potatoes, Onions, pescatarian, scallops, Vegetables. Bookmark the permalink.